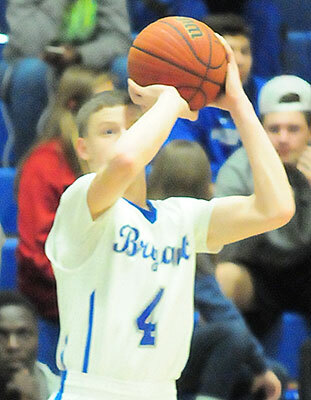 — In their loss at Little Rock Central on Friday, the Bryant Hornets scored 6 points in the first quarter. — In their last victory last Tuesday against Little Rock Catholic, they trailed the winless Rockets 12-11 at the end of the opening period. — The game before that, they were down 19-14 at Fort Smith Northside in a game they lost by 2 in overtime. 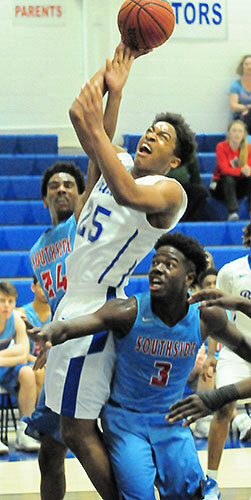 — At home against Northside, they built a lead but it was only 11-4 and Northside rallied to win by 10. — Against Conway, they were down 8-4 at the first break and lost by 6. — At North Little Rock, they scored 5 points in the first quarter before taking the conference leaders to the edge, losing by 2. — In a game the Hornets won over Cabot, they trailed 14-6 at the end of the opening period. Hornets head coach Mike Abrahamson decided that, on Tuesday, he’d try a different approach. The team came out trapping full court in 2-1-2 and 1-2-2 presses. “We just kind of wanted to switch it up a little bit and see if we could get off to a quicker start,” Abrahamson acknowledged after that game. “We kind of did. It wasn’t the best start but we gradually got to where we were playing well. It was a better start than we have been but it wasn’t fantastic. It was good enough to get us started. That “little better” start turned into a lot better result as the Hornets handed the struggling Mavericks a 61-31 loss in which the sportsmanship rule went into effect early in the fourth quarter. The victory officially clinched a bid to the Class 7A State Tournament for Bryant and eliminated the Mavericks. 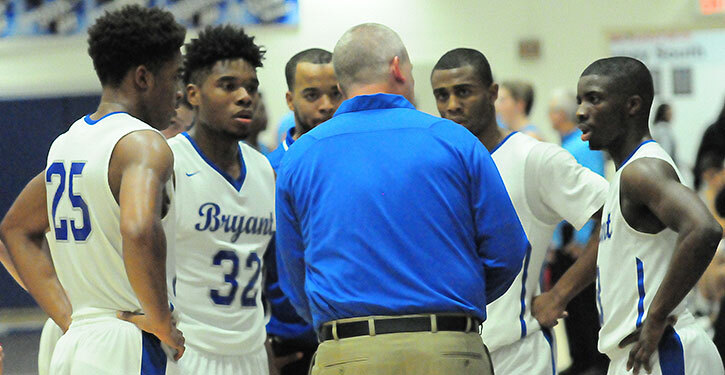 Bryant has three more games in which to improve its seeding for the tourney. A visit to Cabot will occur this Friday then they’ll host North Little Rock on Senior Night next Tuesday before finishing up at Conway on Friday, Feb. 24. “That’s good,” Abrahamson said of securing a bid, “but, you know, there was a time we wished we’d win the conference. Now, we just need to get into the State tournament, take them one at a time. We’re in but our work is not over. 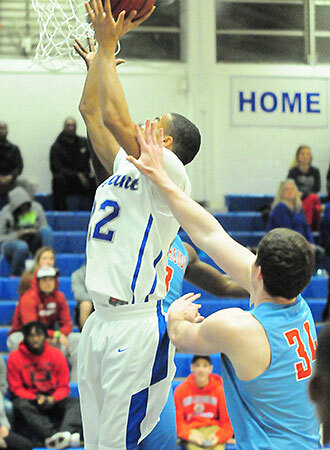 Tuesday’s meeting with Southside was a far cry from the 47-46 win the Hornets eked out in Fort Smith on Jan. 17. “Up there, we only had two spurts of good offense,” Abrahamson recalled. “The very beginning of the game then the end of the third and beginning of the fourth. We were able to get up by 11 then we let them get back in it and we had to make free throws to win it. The starters for the Hornets produced a 5-2 lead on baskets by Braylen Steen and Lowell Washington plus a free throw by Calvin Allen. Abrahamson then subbed in a new five who did not let down with the defensive pressure. Deron Canada made a steal that led to a jumper in the lane by Marvin Moody. Canada followed a Southside timeout with another theft that he cashed in to make it 9-2. Zion Releford interrupted for the Mavericks but Kaleb Turner tipped in a miss for Bryant. Southside got within 11-7 before Canada fed Moody for a layup. It was 13-8 going into the second quarter. Abrahamson re-entered his starting five and, as it turned out, subbed five at a time for most of the rest of the game, a tactic he hadn’t used before. “I was going to do that as my first sub,” he related. “I had that planned. I didn’t know if I’d stick with it. It kind of worked tonight and we stuck with it. I make no predictions about whether we’ll continue that. But it was something I wanted to do tonight just to get a lot of people in the game early, get their feet wet. Doing it the whole game wasn’t planned but it was working so we stuck with it. The Hornets scored the first 8 points of the third quarter to extend the margin to 21-8. Southside was unable to score until Ike Moore hit a layup off a drive with 1:36 left in the half. Bryant’s senior quartet of Calvin Allen, Steen, Washington and Romen Martin each had baskets in the second period, which ended with the Hornets up 27-13. Washington, who led all scorers with 15 points, opened the second half with a post-up bucket. He followed up with an eight-foot jumper off a dish from Sam Chumley, who added on with a 3-pointer to run the margin to 34-13 before Moore ended another Southside drought. With the second five in the game at the 4:30 mark, Rodney Lambert scored of a drive to the rack and Turner hit a free throw. Southside’s Tyrese Simpson had a 3-point play with 2:03 left in the quarter but Moody scored off a feed from Lambert, Canada tipped in a miss and it was 43-18. Releford and Canada traded buckets to make it 45-20 going into the fourth quarter. The starters returned for a brief stint. Three-pointers by Allen and Washington pushed the lead over 30 to made it a mercy-rule game. Martin hit two free throws before the second group returned and Abrahamson got everybody in. Henry Terry capped off the victory with a 3-pointer. Smith 0-3 0-0 0, Releford 3-8 3-4 10, Gatewood 1-7 1-3 3, Moore 2-5 0-0 4, McLellan 1-3 0-0 2, Keller 1-5 0-0 2, Jones 0-1 1-2 1, Simpson 1-1 1-1 3, Solomon 1-3 0-0 3, Jackson 1-3 0-0 3, McGill 1-2 0-0 3, Coleman 0-0 0-0 0. Totals 11-38 6-10 31. Martin 1-4 2-2 4, Allen 2-4 1-2 6, Chumley 1-3 0-0 3, Steen 2-3 4-4 8, Washington 7-9 0-0 15, Cowart 0-2 0-0 0, Turner 2-5 2-6 6, Moody 3-4 2-2 8, Lambert 1-4 0-0 2, Canada 3-4 0-0 6, McIntosh 0-1 0-0 0, Terry 1-1 0-0 3. Totals 23-44 11-16 61. Three-point field goals: Bryant 4-16 (Chumley 1-3, Allen 1-2, Washington 1-1, Henry 1-1, Martin 0-3, Lambert 0-2, Steen 0-1, Cowart 0-1, Turner 0-1, Canada 0-1, McIntosh 0-1), FS Southside 3-11 (Releford 1-2, Jackson 1-2, McGill 1-2, Moore 0-2, Smith 0-2, McLellan 0-1). Turnovers: Bryant 16, FS Southside 19. Rebounds: Bryant 12-20 32 (Steen 3-6 9, Washington 1-4 5, Cowart 1-2 3, Turner 2-1 3, Canada 1-2 3, Chumley 0-2 2, Lambert 1-1 2, Martin 1-0 1, Allen 0-1 1, team 2-1 3), FS Southside 7-10 17 (Keller 4-2 6, Gatewood 0-3 3, Jones 1-2 3, McLellan 1-1 2, Jackson 1-0 1, team 0-2 2). Team fouls: Bryant 14, FS Southside 10.